This charming 2-bedroom home has many unique features to love, such as hardwood and tiled floors, arched doorways, and crown molding. 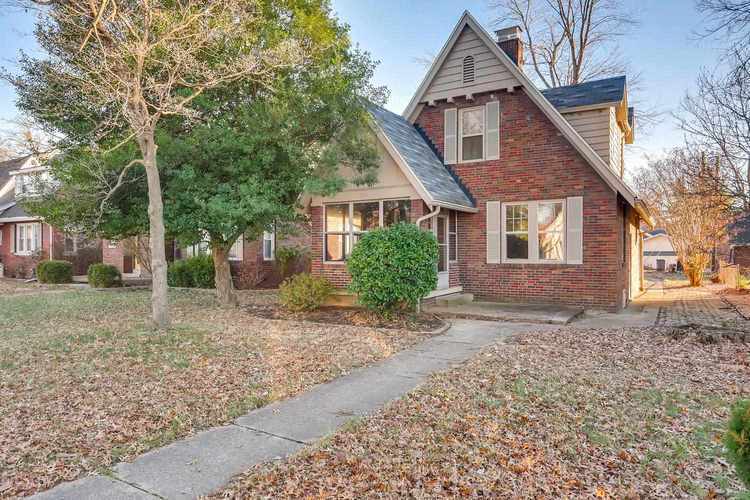 There is an enclosed, tiled front porch that welcomes you to the home, and as you enter the home's living room, you see the gorgeous brick fireplace with a tiled hearth, crown molding, and a built-in corner shelf. The home also features a formal dining room for entertaining, and the kitchen has tiled floors, an abundance of cabinet space, a nice tiled backsplash, and there is a breakfast nook. The master bedroom features custom built-ins for additional storage, and the second bedroom also has a large closet. The bathroom has nostalgic basket-weave tile flooring and built-in linen storage. The exterior features embellished gables, mature trees, and a cobblestone path wrapping around to the large backyard. This charming home has lots of potential and personality you will love. Directions:From Weinbach Ave: E on Mulberry St to home on right.